North Georgia Eye Care, LLC and Dr. Robison take pride in providing the best eye care to our patients. Part of providing quality eye care is keeping up with the latest in science and technology. In April, 2014, we added the Optovue iVue SD-OCT (Spectral Domain – Optical Coherence Tomography). The OCT is like an MRI of the eye, but painless and quick. The results provide high definition cross sections of the eye. This advanced technology can help detect potential vision threatening diseases in their early stages when they are most treatable. More importantly, the doctor is able to see the layers in your eye that are invisible with traditional eye examination techniques. This is the new standard of care to assess sight threatening ocular diseases such as glaucoma, macular degeneration and diabetic retinopathy as well as detect ocular complications from certain medications like Plaquenil. The particular OCT that we purchased also scans the front of the eye (the cornea and iris) to evaluate potential for disease and to aid in difficult contact lens fittings. For following current ocular disease the full scans of the retina, optic nerve and cornea are billed to medical insurance. 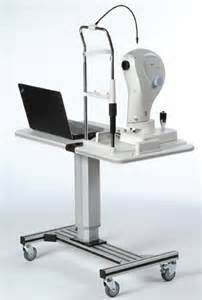 We are pleased to offer retinal scanning to our patients as a baseline scan, iWellness. We recommend this scan for patients with a family history of glaucoma or macular degeneration. A patient with reduced vision would benefit from the scan to aid in diagnosis. This iWellness scan has a charge of $35, and, if anything is found, medical insurance can be billed for the full scan. Dr. Robison will discuss all findings and answer any questions during your examination. This scan will become part of your permanent patient record and compared during future visits.